The idea of comparing the pace of development of computers to cars has been around a while. Snopes traces the idea all the way back to some early-internet joke in 1997, even. Fundamentally, it’s sort of an absurd comparison—the two technologies are so different, they’re really not comparable. I did it anyway. Just for fun, fully aware that, yes, it’s kind of stupid, I just wanted to crunch some numbers about specs of cars and computers over 35 years of development and see what happens. For the 1982 side, I picked an Apple II Plus, a popular computer of the era that introduced many of us to the joys of virtually dying of dysentery. For the car, I wanted to pick something we still have today, so I went with the base-level four-cylinder Ford Mustang. 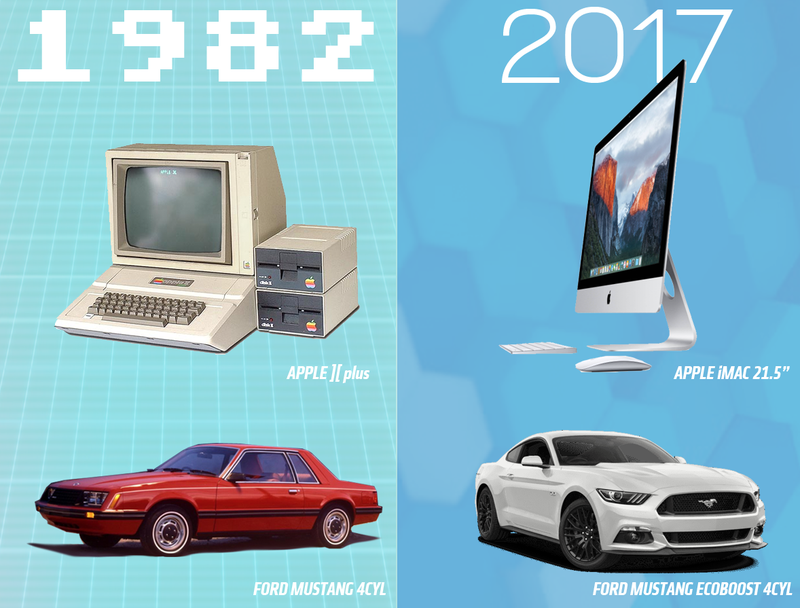 For the year of our snappy lord 2017, I’ll use Apple’s current base-level desktop computer, the 21.5" iMac, and the four-cylinder base Mustang, the Mustang Ecoboost. I picked four specs to measure for each: for the computers I picked RAM (random-access memory), storage memory capacity, CPU speed, and price. For the car I picked horsepower, fuel economy in MPG, 0-60 mph time in seconds, and price. Equating the metrics isn’t perfect by any means, but here’s what I did: 0-60 time and CPU speed (they’re both speed related), RAM memory and MPG (because having more RAM tends to make the computer run more, um, efficiently, sort of? ), storage capacity with horsepower (because knowledge is power), and price to price. The results are pretty striking: computers have developed insanely quickly, and if cars developed at that pace, well, look at the chart. Again, this apples and oranges, or apple and horses, or whatever. It’s not a really rational comparison. But it’s fun to think about, right?